QUESTION: You said while the energy output of the sun declines, at the same time the summers can get hotter. It seems strange but my daughter lives near you in Florida and it is hotter here in New York. Is the weather just getting crazy? ANSWER: This summer we should see sweltering heat build across parts the northern United States and over western and central Europe throughout the summer months. The temperatures will be hotter in the Northern regions which definitely seems crazy. It is more comfortable in the South than in the North. These regions will simply see high temperatures past 90 F (32 C) up to 100 F (38 C ) on numerous occasions from June through August from probably Toronto to the Carolinas in the USA and in Europe from Frankfurt down to Milan/Rome.and Berlin, Germany. There seems to be a pattern historically of dry summers and cold winters for Europe while in the Eastern US there will generally be flooding. This can contribute to producing dangerous conditions for not just people, the young and elderly, but to further the cycle of drowning crops in the US to droughts in Europe. This historically also tends to create the cycle of famine. The entire process is plagued by higher volatility with the swings to both extremes. This builds in cyclical force much as a bull market in a volatility period. Meanwhile, the largest iceberg to ever threaten the shoreline in Greenland has appeared. 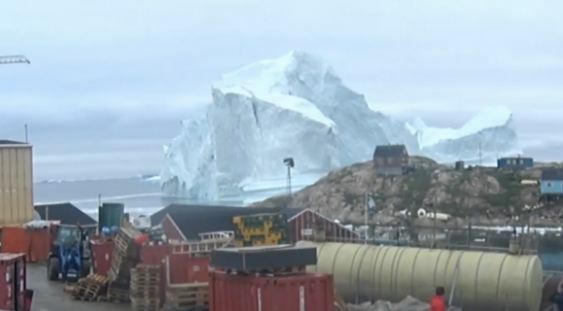 An 11-million-ton iceberg, 300 feet tall, is now hovering over the town of Innaarsuit in Greenland. The massive iceberg floats dangerously close to shore coming within just 500 to 600 feet offshore last weekend. This is all part of perhaps the shift in climate that is brewing. Magnetic Poles Are Moving Rapidly as Never Before – Precursor to a Pole Shift? Assange’ “Special Software” was LINUX?